Rest is a much needed part of a son's life. It is not something that we do when we are about to collapse in exhaustion. It is something that God has intended to be part of our every day life. It is so important to God, that He actually told the Israelites to dedicate one day out of seven for the sheer purpose of resting. Even if you look at our own bodies, they were created for resting. In order for us to live a healthy life, we are supposed to sleep 1/3 of our lives. If we don't, our bodies can wear down and we can get sick. God designed us so that we would need to rest on a daily basis in order to live a good life. 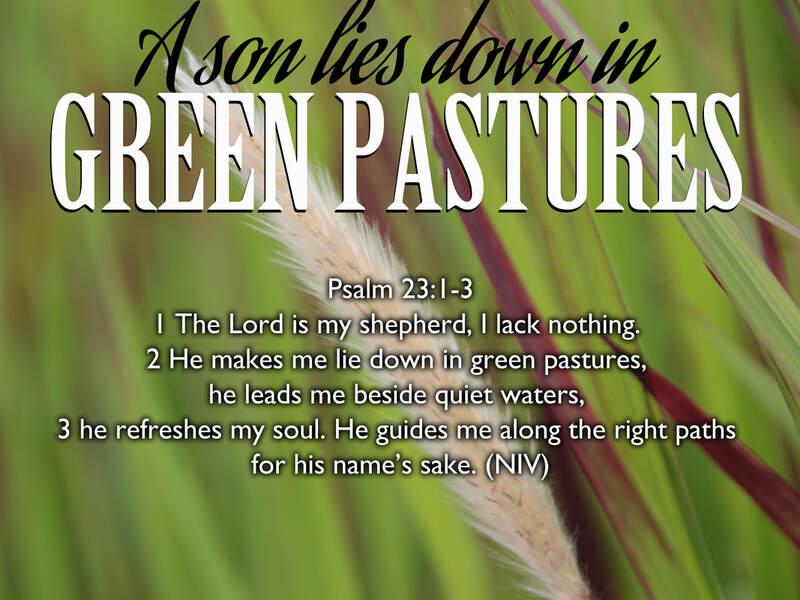 I find it interesting that David says in Psalm 23 that the Lord MAKES him lie down in green pastures. Sometimes in the busyness of life, we don't take the time we need to care for ourselves like we should, so the Lord causes circumstances to happen so that we have no other choice but to rest. He MAKES us lie down in green pastures and He leads us beside still waters in order to restore our soul! If you have ever felt that you were backed into a corner and had no choice but to 'be still and know that He is God' (Psalm 46:10), you will know what I am talking about. Sometimes we get to rest by our own choosing and sometimes it comes by an intervention from the Most High. Either way, I believe that our God and Father wants us to embrace these times in our busy days and these seasons in our busy lives when we can truly value resting in His presence. Psalm 37:7 tells us to "rest in the Lord and wait patiently for Him". When we learn to rest and wait, we are ceasing from our own works and entering into the Sabbath rest of God Himself (Hebrews 4:8-11). When we learn to rest, we begin to value things that are greater than our own productivity. When we still our hearts, we find that not only does God speak in the silence, He IS the silence! In an orphan world system that is busy-busy-busy, the ability to be still and rest and lie in green pastures is not always valued. It may be valued for a short time like going on a vacation, but it is not valued as a way of life. The same shepherd boy who learned the secret of lying down in green pastures, is the same shepherd boy who brought down the giant who was tormenting a nation. My prayer today is that we would all learn the secret of being able to lie down in green pastures so that our Heavenly Father could restore our weary souls. I pray that the rest of God would descend upon each one of us like a warm blanket today. May our sleep be sweet. May we find solace beside quiet waters. May we even learn how to sleep in the midst of the most tumultuous of storms!